Podiatry is a field of medicine that strives to improve the overall health and well-being of patients by focusing on preventing, diagnosing, and treating conditions associated with the foot and ankle. Doctors of Podiatric Medicine (DPMs) are physicians and surgeons who practice on the lower extremities, primarily on feet and ankles. For more information about podiatry, click here to visit the American Podiatric Medical Association.Doctor Sherman is an expert in non-invasive Extracorporeal shock-wave therapy (ESWT) for chronic heel pain. Dr. Sherman treats a wide array of foot problems ranging from rheumatoid arthritis to Diabetic Foot Care. 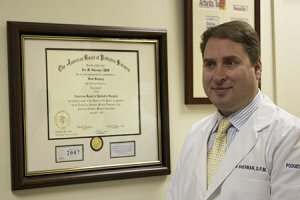 Dr. Jon M. Sherman was born and raised in Rockville, Maryland and graduated from the Bullis School. He is a graduate of The University of Wisconsin-Madison and graduated with honors from Temple School of Podiatric Medicine in Philadelphia in 1998. He went on to a three year podiatric medicine and surgical residency at Tenet-Elkins Park Hospital. Dr. Sherman is a Fellow of the American College of Foot and Ankle Surgeons and a Diplomat of The American Board of Podiatric Surgeons. His training has focused on both invasive and non-invasive treatment from sports injuries, wound care, and overall treatment of the foot and ankle. Dr. Sherman has served as a consultant for the Penn Relays and Marine Corps Marathon. Dr. Jon M. Sherman is Board Certified, in Foot Surgery, by the American Board of Podiatric Surgery. Dr. Sherman is also a Fellow of the American College of Foot and Ankle Surgeons. The Gaithersburg Foot and Ankle Surgery Center is a fully accredited surgical center in Dr. Sherman’s office. Dr. Sherman has opened his own ambulatory surgery center, certified and licensed by the state of Maryland. We found that we could offer specialized procedures in a more informal setting at a fraction of the cost associated with hospital surgery. Because outpatient foot surgery is all that we do here, we have become extremely proficient at this and our staff has done the procedures you may need hundreds of times. We have all of the latest monitoring devices, operatory equipment and do procedures under local anesthesia or intravenous or conscious sedation. Our anesthesiologists are Board Certified and patients usually leave within 30 minutes after the completion of their procedure. We have a casual waiting room for family and friends. Parking is directly out front and free. Jon M Sherman D.P.M Pc has been recognized as one of the top Gaithersburg Podiatry practices.